My first birch bark stacked handle knife ! And quite proud of it. The 2 things I was afraid of being difficult, turned out to be quite easy, making the bolsters and the peening at the end of the knife handle. This one is a gift for an older gent. 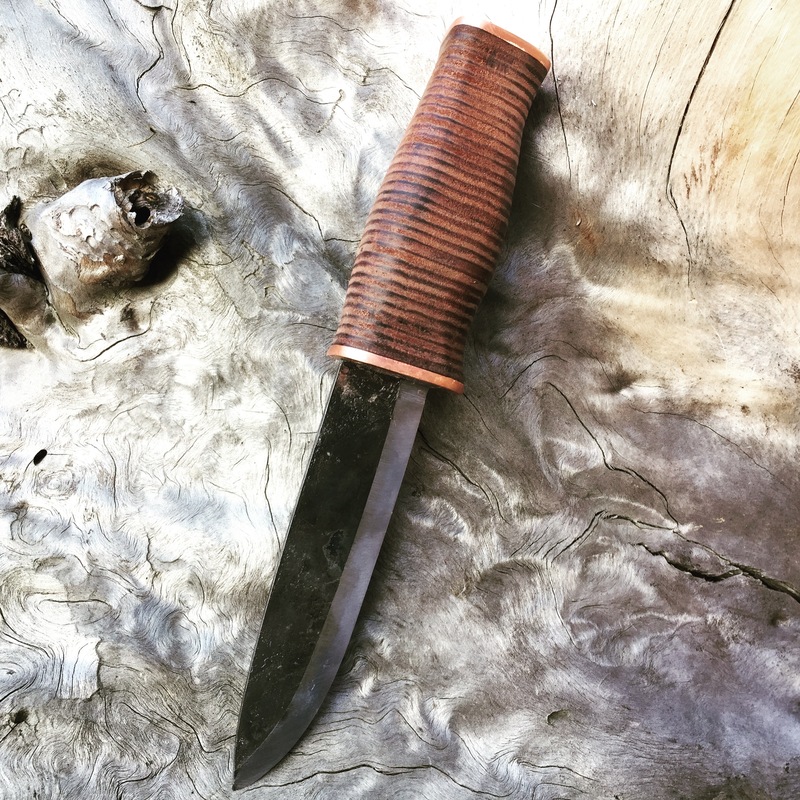 Re: My first birch bark stacked handle knife ! Nice video. I like that way that turned out. You really condensed a lot of time down in the video. How long did you work on the knife? It came out looking really nice. I've done a stacked leather handle before but not birch bark. Nice. Bet it feels good in hand. Nice job on that Dabberty. Your fit and finish looks terrific and the overall design is A+. Thanks for the video. I won't post a pic....mine is pretty rough yet. I have never had a knife with a birchbark handle, but I have had a couple with stacked leather handles. The leather has deteriorated to a certain degree on both of them and I am wondering if the birchbark would last longer than the leather? Seems to me there would be a good chance that it would, merely because of the oil that is present in the bark. I really like the handle size on yours, Dabberty......looks like it would be very comfortable and 'grippy,' too. You do nice work! Good work Dab. Lucky old gent. That is awesome. Great job. Nice work on the knife and the video. Thanks for sharing. Also the leather stacked knife is now done. I left the handle a bit big, so the future owner can shape it himself to whatever fits him perfect. The handle did get some coats of sno-seal though. It is amazing how comfortable and 'warm' these birch and leather handles feel in the hand, never expected that. I like that Dabberty. It has a classic blade and a great looking handle. When shaped as the new owner wants it will be darn special.